Place turkey tenderloins on a baking sheet and season with salt and pepper. Roast 35-45 minutes, until internal temperature reaches 165 degrees. Remove, allow to cool, then chop or shred in bite sized pieces. In the meantime, whisk together mayo, yogurt, lime, honey, curry powder, cayenne pepper and a pinch of salt and pepper in a medium glass bowl. Taste and adjust seasoning, if necessary. Fold in grapes, jalapeno, cucumber and cilantro. Place cooled turkey in bowl and stir to combine. Place lid on container and place in the refrigerator for at least 30 minutes. 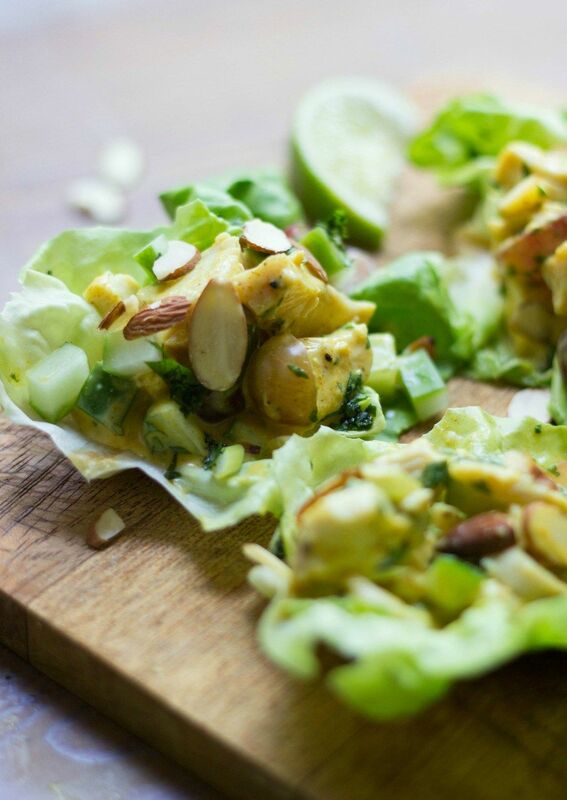 Arrange lettuce cups on a platter and fill with curried turkey salad. Top with almonds or cashews and additional cilantro, if desired.